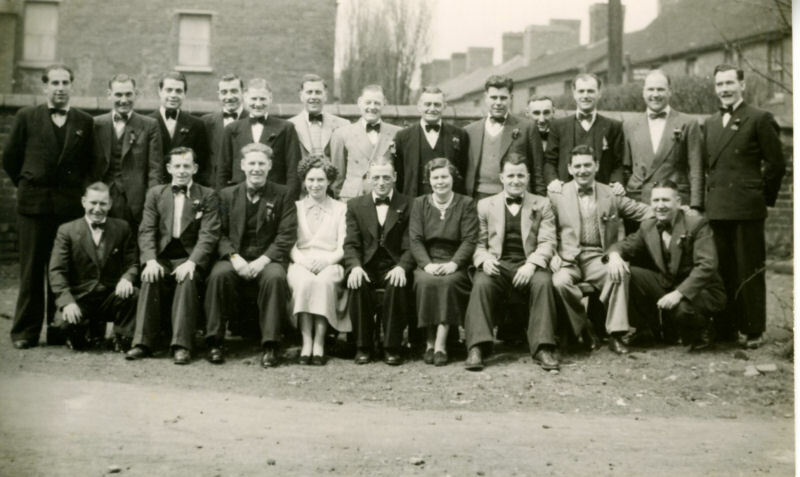 This one was taken prior to my uncle Ron Dean seated front left of centre with his wife Jean(nee Mason) left for Canada in 1954. Kneeling Tom Pritchard, Billy Dyke, Ron Dean, Jean Dean(nee Mason) Frankie Birch, Maggie Birch, Babs Jones, ? kelsal (sign writer opposite St Johns), Horace Dean my father. My picture shows them wearing Bow Ties your picture show some of them with shirt fronts wore outside their jackets, Balloons on sticks, these they had to wear or carry from their home in full view of the village people. I have many letters and suggestions as my father was secretary for many years, oh they also had to wear a cork with ribbons attached to it in their lapel. If anyone failed to wear his cork or attend with the object that was required that week then they were find.